Welcome to the website of the Multihull Division of the Royal Motor Yacht Club, Broken Bay. 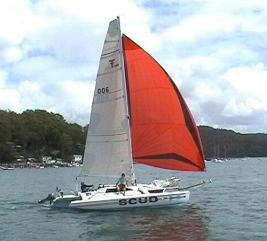 We are a group of multihull enthusiasts sailing most Saturdays throughout the year on the magnificent waters of Pittwater and Broken Bay NSW, Australia. 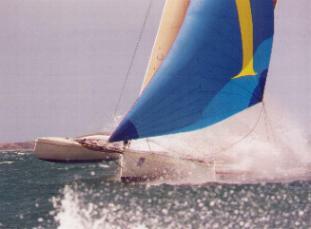 Our current sailing program focuses mainly on round-the-buoys racing. However, we are actively looking at broadening our program to include both cruising and social sailing activities to accommodate a wider range of interests. We are always happy to share our knowledge and experience with newcomers to multihull sailing. You are welcome to join us for a sail at any time, register for a crewing position or just turn up for a chat. Our current Saturday racing fleet comprises both catamarans and trimarans ranging from 24 to around 45 feet and includes designs from the boards of Ian Farrier, Tony Grainger and Lock Crowther. A major activity in our racing calendar is the organisation and running of the annual Lock Crowther Multihull Regatta (LCMR) over the October long weekend. 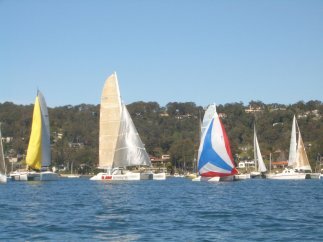 This Regatta typically attracts many of Australia’s fastest multihulls, as well as cruisers, for two days of fabulous fun both on and off the water. Sponsors’ prizes are awarded at a sumptuous Regatta dinner for places in Racing, Cruising and OMR divisions. Find out more about the Lock Crowther Regatta here. A range of sponsorship opportunities is available. Please contact the Club or the Regatta Co-ordinator for further details on how your organisation can benefit from an association with this prestige sailing event. Sponsorship packages can also be tailored to your specific needs around one or more of our regular race series or around support for our weekly prize giving (currently wine based). Please visit our Sponsorship Opportunities page or contact our Public Relations Officer for further details. As RMYC members, we have access to all of the club’s extensive facilities including dining room and bistro, meeting rooms and bar, swimming pool and BBQ area, as well as the full range of modern marina facilities. Contact us through the Club or any of the Committee members...many of whom can be found in the bistro bar at the conclusion of racing most Saturdays! Please click on the menu items above to browse the rest of our site. Visit our News Desk on a regular basis to keep up to date with what’s happening on and around Pittwater and in the multihull world generally. Under the Forms menu, you can ask to be added to our database to receive Newsletters and other communications from us, join our Crew Register, or arrange a "test sail" on one of these fabulous boats.